As mentioned a few weeks ago, my overlocker blades are blunt. I have ordered a new set and while I wait for them to be delivered I really don’t want to be using the overlocker. That meant the things I had planned to make had to go on the back burner. I was still keen to crack on with my make nine and keep reducing my stash! Luckily there was one thing on there that didn’t need any seam finishing – the boiled wool coat. 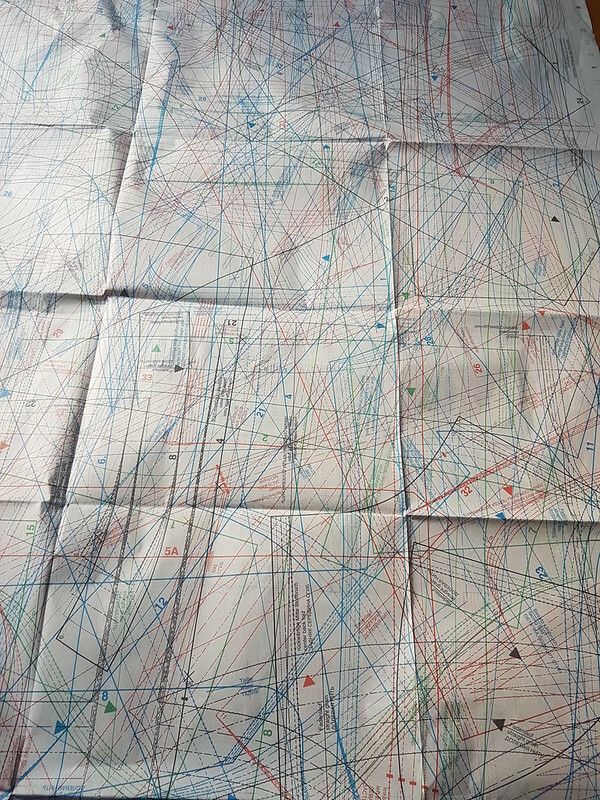 The only thing to sort out was the pattern to use. Now I haven’t got many coat patterns to choose from and I am keen to use as much as I can from my stash this year so I turned to my growing collection of unused Burda magazines. I found the perfect coat pattern in the 11-2017 issue. 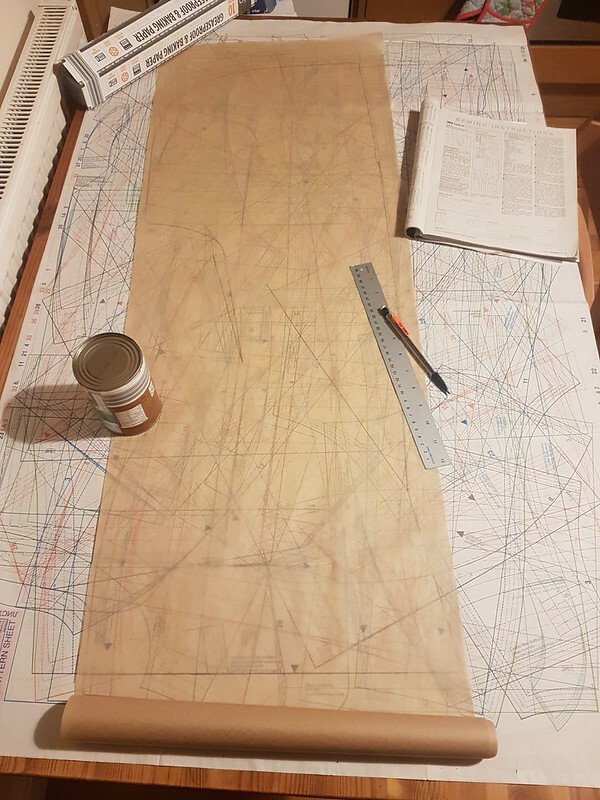 The maze of lines to puzzle through – I’m not entirely sure I traced out the front and the hood correctly! I decided to flat fell all the seams for strength since the fabric was quite heavy. Having never done it before I searched the technique. I found there were at least 3 or 4 different ways of achieving this. 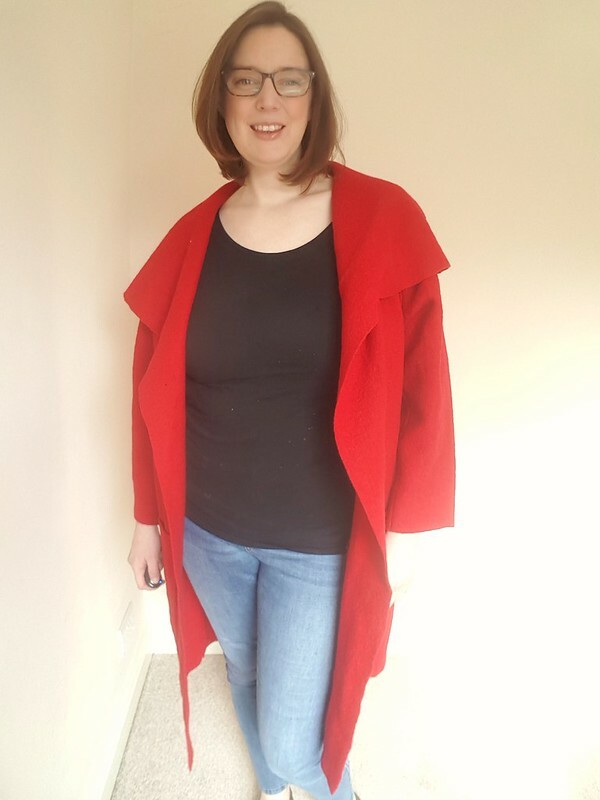 This is one of the things I love about sewing – there’s always another way of doing something, so if something doesn’t make sense just try another method! 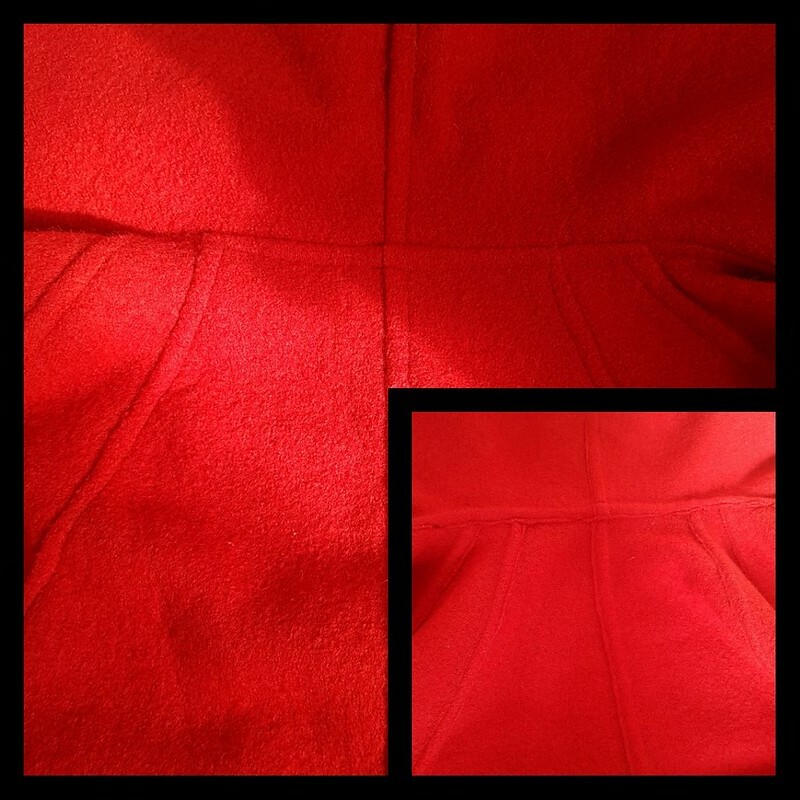 The way I did it was to sew the seams with the right sides together, trim one side of the seam allowance and then fold the other side over and stitch down. I didn’t fold it under as the fabric doesn’t fray and it would have been far too bulky. 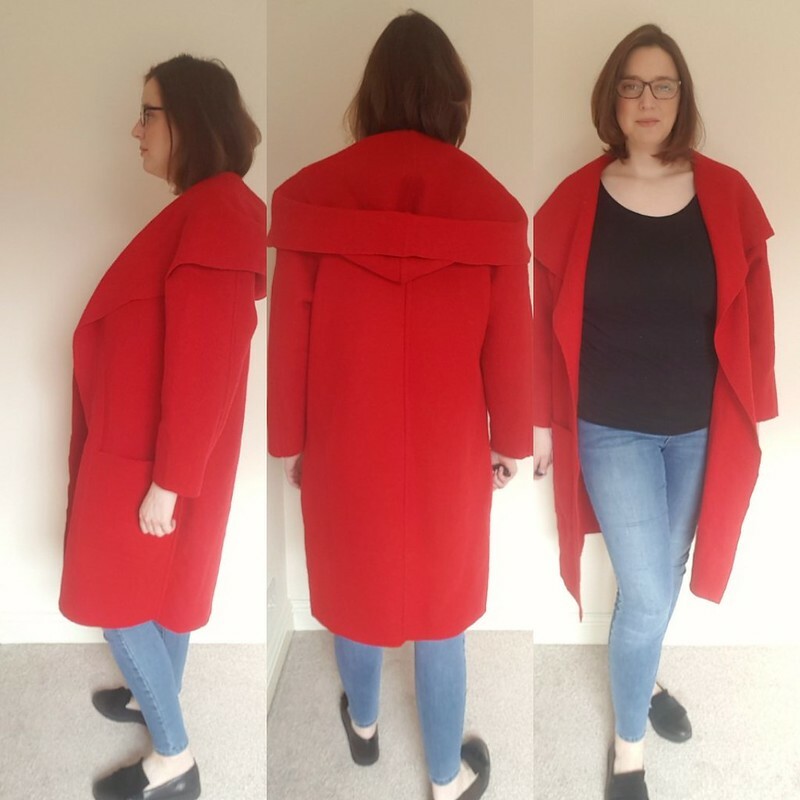 I didn’t line this coat or use any of the facings, so it was a very simple sew. It also meant that instead of taking 4m it only took 2.3m of fabric, which is great as I only had 3m anyway. I’ll see of I can squeeze out a little red coat from it for my daughter. However now it is all done I’m not sure about it. Does it look too much like a dressing gown/bath robe? Would it be better of I replaced the tie with a button? 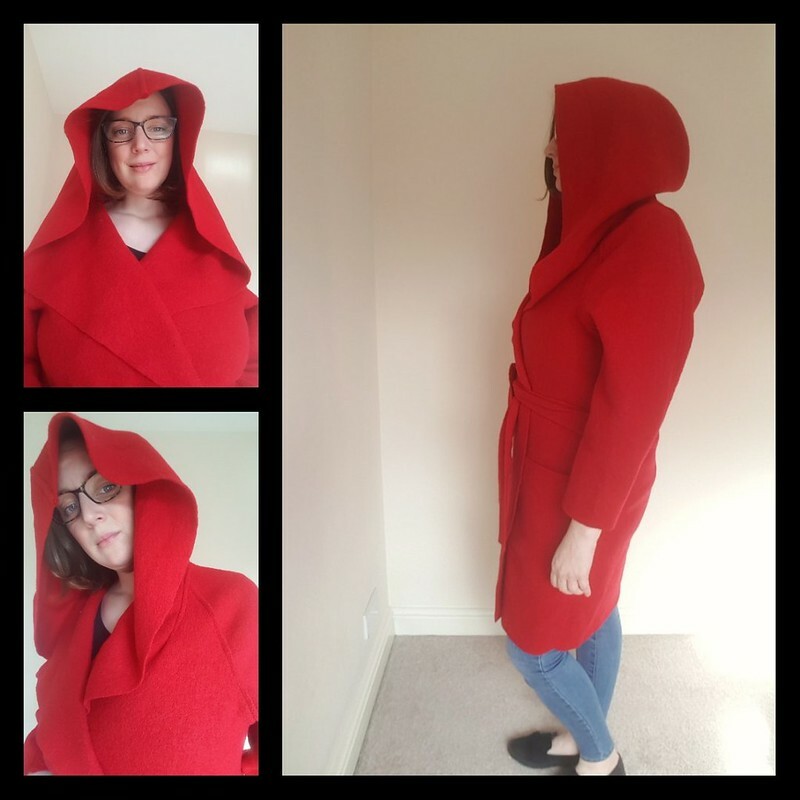 Does the hood look a bit Handmaidens tale/Emperor Palpatine? Should I cut off the hood and turn it into a collar? Should I do both? Please weigh in with your thoughts in the comments. Sizing: size 36-44. I cut size 36, the size chart would put me in size 44 for the bust and 42 for the waist and hips. I cut the smallest size possible based on measurement of the pattern as I didn’t want masses of ease. Currently the front overlap is a bit small but I am still 10kg up on my pre pregnancy weight. The shoulders fit very nicely on this smaller size. Were the instructions easy to follow? 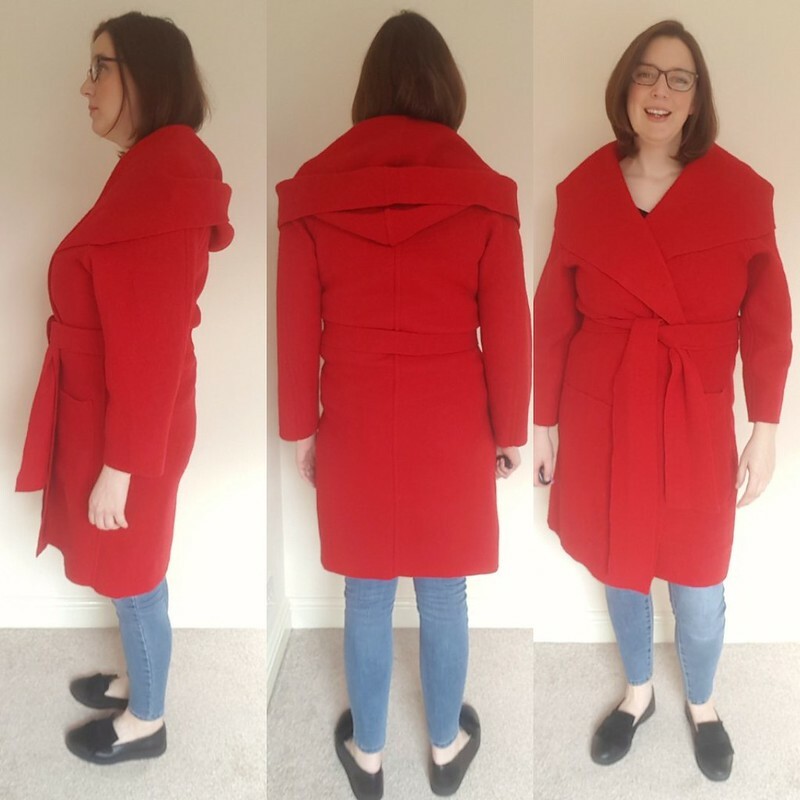 This was a simple unstructured coat, which I then further simplified, so the instructions were more than adequate for me. Burda magazines have very concise instructions – they assume you know what you are doing, so things like stay stitching aren’t mentioned. Likes/dislikes: The tracing gave me a headache – so many overlapping lines to follow. But I guess that is the trade off for all the magazine patterns for the cost of 1 envelope pattern. I also liked how Burda numbered the seams- it was very helpful when sewing up. Fabric used: this boiled wool . Very nice quality, stable and easy to sew. Alterations/design changes? As it is made from boiled wool the facings are not required. I also omitted the lining. I flat felled the seams to get a nice finish inside and out. If I made it again I think I would add cuffs to finish the sleeves. I might add them to this one if the sleeves bother me. Would I sew again? 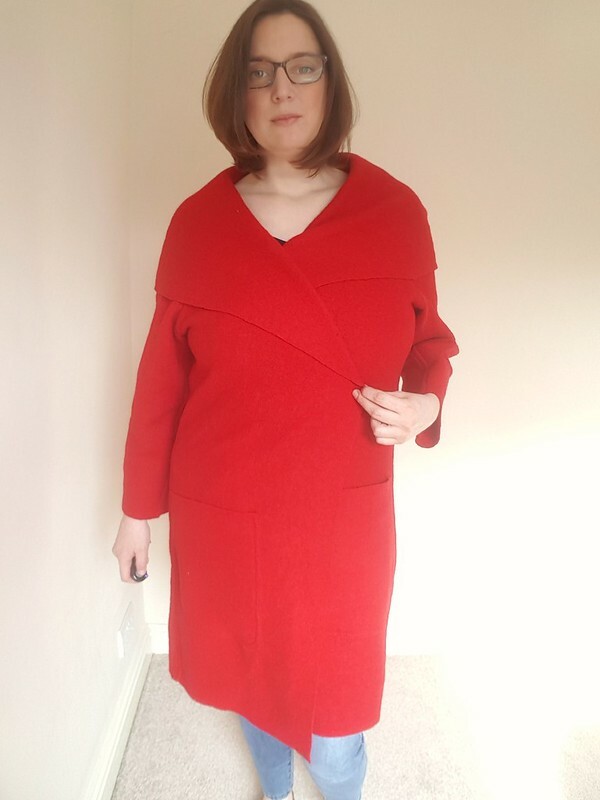 I would recommend the pattern but I am unlikely to sew it again anytime soon. 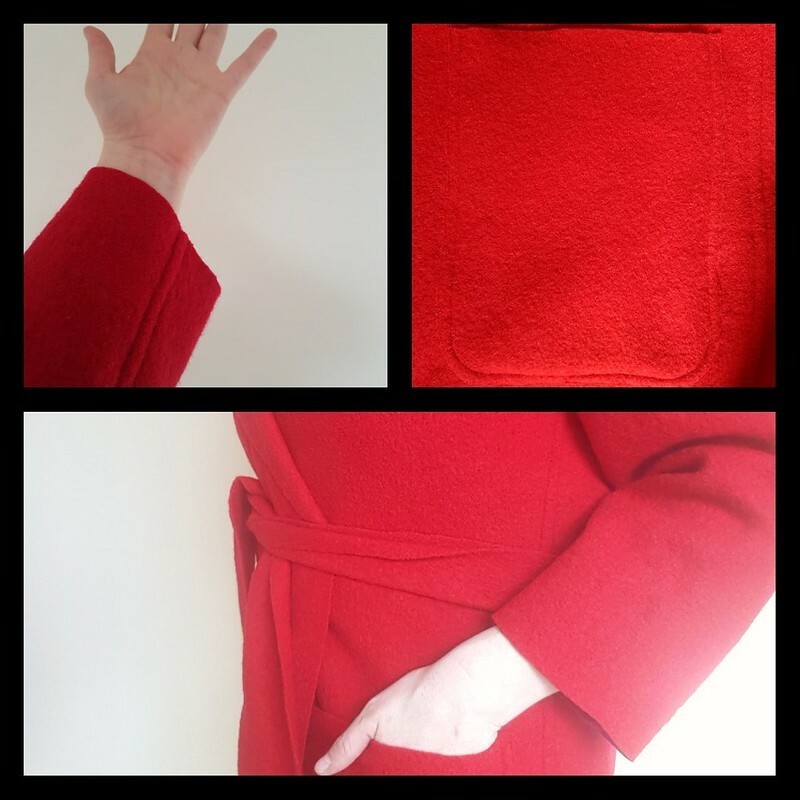 It would be lovely in a double faced fabric, as with flat felled seams you would have a reversible coat. This is the first time I have worked with boiled wool. It was very nice to use. It is a shame that the material is not more versatile so it could be used in more items. I have never flat felled a seam before. 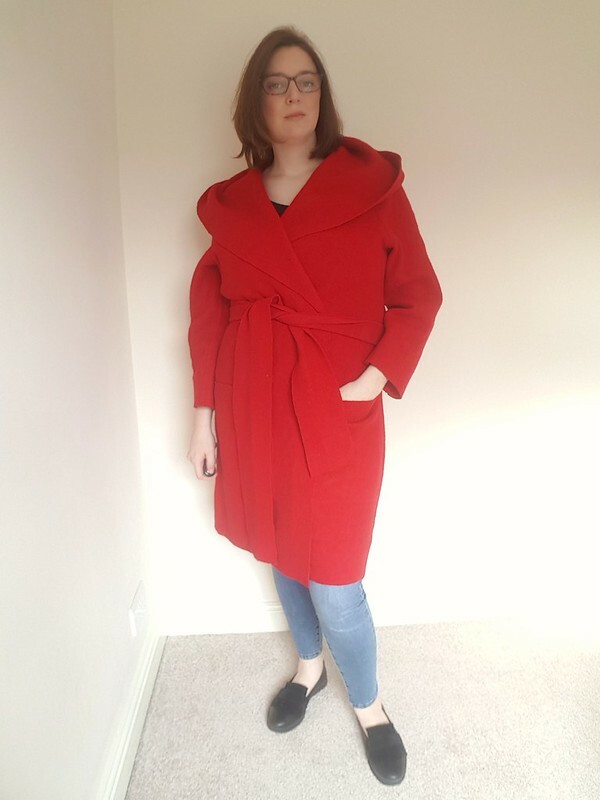 Turns out it is an easy technique with a great finish- I really think it elevated this coat, and looks very professional. The boiled wool fits in with the fabric recommendations of a slightly rough finish and being tactile. The colour is nice and bright as well. Next Post Refashioning all the jerseys!